The new Tacoma Narrows Aviation terminal complex at Seattle-area Tacoma Narrows Airport will also include a new 6,000-sq-ft hangar, bringing the facility to 30,000 sq ft of aircraft storage space. 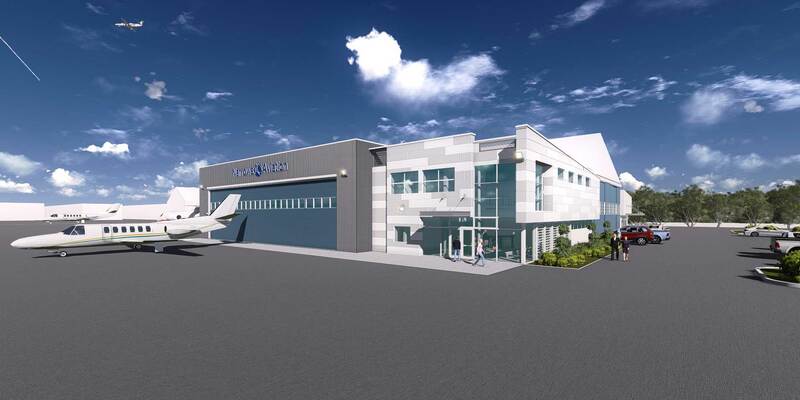 Seattle-area FBO Tacoma Narrows Aviation has completed a major renovation on its 13,000-sq-ft hangar, part of a project that will see the Avfuel-branded FBO, and one of two service providers on the field, move into a new complex to be completed this fall. The 1960s-era hangar, which can accommodate aircraft up to a Challenger 604, received new exterior and interior siding, insulation, windows, lighting, electrical and fire suppression. The approximtely $2 million project will also replace the current 60-year-old terminal with a 5,000-sq-ft, two-story contemporary building. It will include a catering kitchen, media room and flight planning area on the ground floor, with the upstairs reserved for leased office space. Adjoining the executive terminal will be an additional 6,000-sq-ft transient hangar, able to accommodate up to midsize business jets, bringing the facility to 30,000 sq ft of total hangar capacity. Located 30 miles south of Seattle, the county-owned airport features a 5,000-foot runway and on-demand U.S. Customs clearance.